If you don’t wear a lot of jewelry then when it does come to choosing some it can be difficult as the jewelry you wear can be very personal. Jewelry comes in all different sizes, shapes, textures and colors. Then there are various options for rings, chains, anklets, bracelets, earrings, and necklaces and each piece of jewelry has its importance, value and need. 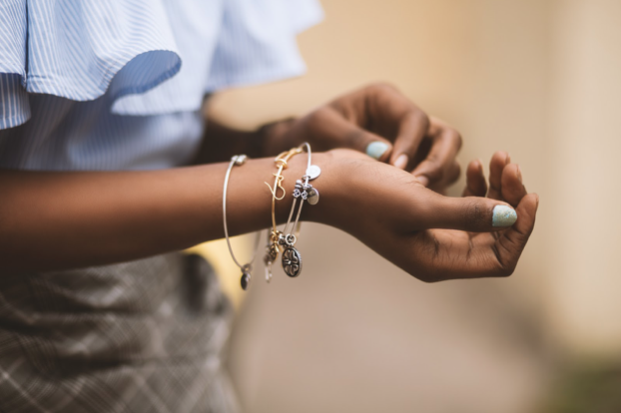 Even if you’re not spending a lot of money on your jewelry, it is still important to you, and whether it’s for everyday wear or you’re looking for something to wear on special occasions, it’s good to experiment with what suits you and what styles you like best. Do you have pierced ears? If so, do you prefer stud earrings or dangly ones? Experiment with hoops, chandelier-style or other drop-type earrings to see which ones suit your face and your hair, you can buy some reasonably inexpensive earrings to do this. Do you have or do you want an everyday necklace that you wear for work or play, or do you prefer having a few dressier pieces that you can wear for special occasions? Again you can experiment with style and length, do chain necklaces with pendants suit you? Or are solid ones where the necklace itself is the attraction more for you? There are so many choices when it comes to style, for example, there’s choker-length, short, long and you could have chain-link, beads or something entirely different. Do you like Bangles, Charms, Rope, or Mesh? There are again so many options for what you might choose to adorn your wrists. Depending on what you do for a job, chunky or bangle bracelets might not suit your everyday life. However, you could have some bracelets ready for special occasions and weekends. Rings can also depend on what you do every day, if you are in a medical or food-handling profession and need to wear gloves, smaller rings would probably be a better choice than ones with gems that stand up straight. Or, if you care for young children or babies, you will probably want something that doesn’t have any edges that could potentially scratch them. Then what do you like? Are you a fan of something large and eye-catching, or something smaller? Once you know what kind of look you’re going for and you have a budget, then you can have a look at what type of metal you would like your jewelry to be made from. Most jewelry is made of one of three metals: platinum, gold or silver. Platinum is hypoallergenic and ideal if you have sensitive skin. It’s also durable, tarnish-resistant and easy to care for. Then you have gold which can be yellow, white, rose or black. Gold is also resistant to rust, tarnish or corrosion and the number of carats tell you how durable it is. Sterling silver is a very cost-effective choice, more so than gold or platinum, and it’s also durable and beautiful, and it’s easy to prevent silver tarnish. You should choose a metal based on how it looks with your specific features, such as hair color and eye color and most of all pick something that you love.